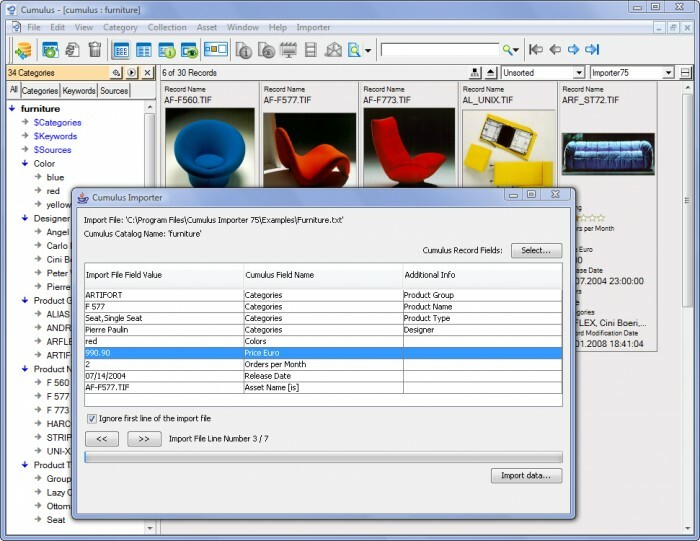 The Cumulus Importer enables you to import information into Cumulus. You can import information from another database system, Excel spreadsheet, or text list into the fields of your Cumulus catalogs. Information can be assigned to each field (Record Field or Category Field). The metadata can be imported into text fields, string list fields, or into the category tree. Cumulus Importer supports saving the field assignments in an Import Scheme File. This is helpful for user that have frequent import tasks, and for configuring the import setup if a new import configuration is similar to the ones already used. While importing into records, new Categories (or Category Hierarchies) and missing list entries can be created in the Field Definitions, so these new objects can be assigned to the record. You have the option to create missing Categories / List Entries or just use the available ones in the catalog for the import. You can specify the Character Encoding of the import text file (ISO-8859-1, UTF-8, etc) so now it’s easy to import metadata from platforms that support different character encodings. In the import setup, you just specify the character encoding used while creating the text file and the Cumulus Importer will convert the text using the encoding necessary for the Cumulus Client platform on Mac OS X or Windows. Contact us to learn more about Cumulus Importer.